At the top of the help panel, you'll see the top Knowledge Base articles for the specific part of the tool you're in. 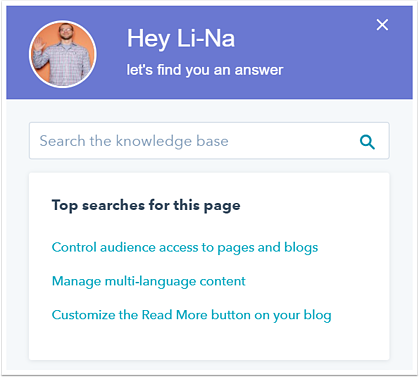 You can also search the HubSpot Knowledge Base and view help articles within this panel, to keep working in-app while you read. If you prefer to view the full article in a new browser tab, click Open in new tab externalLink at the top of the article. 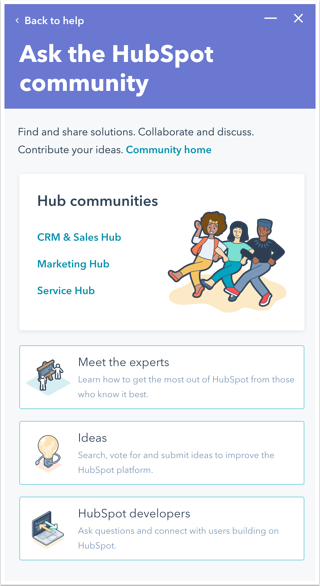 HubSpot’s mission for the community is to provide users with a place to ask questions, find answers, and engage with professionals from around the world on HubSpot best practices. The HubSpot Community helps foster conversations and allows you to get the most out of HubSpot's products. To get help or take part in discussions on the community, click Ask the community at the bottom of the help panel. To discuss HubSpot's marketing tools and inbound strategy, click Marketing Hub community. To ask and answer questions about the HubSpot CRM and sales tools, click Sales Hub community. To ask and answer questions about HubSpot's service tools, click Service Hub community. To learn and share in-depth knowledge about web design on HubSpot, click COS Design. To submit, browse, or vote on feature requests to improve HubSpot's products, click Ideas. Click Sign in with HubSpot and log in with your HubSpot credentials. You'll be redirected back to the community where you can browse through topics or create your own. Learn more about the HubSpot Community. If you weren't able to locate a help article to resolve your issue, you can contact HubSpot Support by clicking Contact support at the bottom of the help panel. At the top of the panel, select Call me, Email, or Chat. Next, provide an overview of your problem and a longer description of the issue you're seeing. You can also attach any relevant screenshots by clicking the attach attach icon. If you select Call me, enter a Phone number for HubSpot Support to reach back out. If you select Email me, confirm your Language and that the Email shown is where you want to receive communication from HubSpot Support. If you select Chat, click Start Chat to start a chat session. Please note: HubSpot currently only offers phone support in English. Call-back, email, and chat support is available in English, French, German, Japanese, Portuguese, and Spanish. To request a call-back in a specific language, ensure that your individual user settings are set to that language. Be specific: if a ticket reads “my list isn’t working,” support specialists can’t begin investigating the issue until they know which specific list isn’t working, or what you're seeing on your end that is different than the expected behavior. Include links: support specialists can access most parts of your account. If there's a specific part of the tool you're referring to, you can guide the specialist to the relevant list, workflow, contact, etc., by including URLs in your ticket. Clarify with visuals and activity logs: it can be hard to describe an issue with words, particularly if it’s only happening on your browser, your device, or your office network. It's helpful to include screenshots, videos, GIFs, or HAR files in your ticket when possible. Whether you submit a call-back request, web ticket, or start a chat session, keeping these tips in mind will allow HubSpot's support specialists to begin working toward a resolution as soon as the ticket is assigned. If you're submitting a call-back request or web ticket, click Submit. If you're starting a chat, click Send message. To enter your support inbox, click View your support inbox at the bottom of the help panel. Your support inbox allows you to get in touch with HubSpot Support, as well as view your account's current and past tickets with HubSpot Support. To create a new support ticket, click Create Ticket in the top right. To search and browse past tickets to see how they were resolved, use the search bar in the upper left. In the left sidebar menu, filter between All, Open, Closed, and Favorite tickets. If you're an account admin, you'll also see a dropdown menu where you can choose between seeing all tickets for all users in your account or just tickets you've submitted. Below the left sidebar menu, you'll see your most recent support tickets. Click a ticket to go into the specific conversation to reply to, close, or reopen the ticket. To access a ticket easily from the Favorites filter in the left sidebar menu, click favorite Favorite this ticket in the upper right. 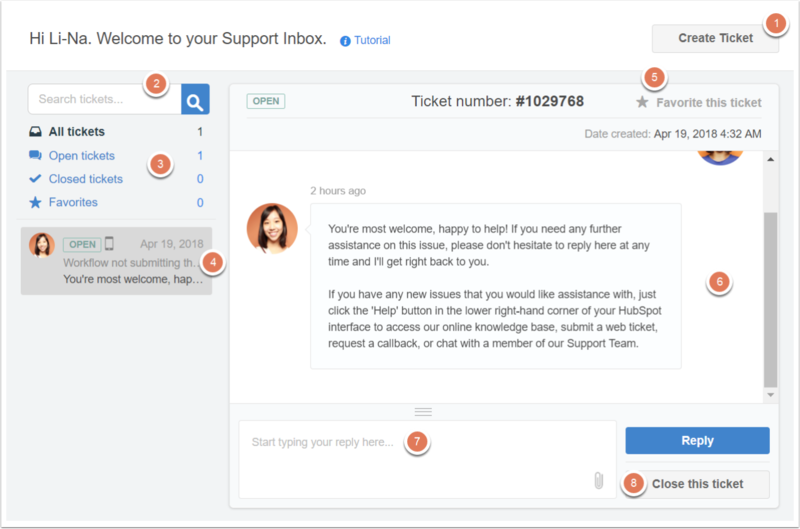 In the ticket body, view your past interactions with HubSpot Support on the ticket. In the text box at the bottom of the ticket, reply to your support ticket and continue in-progress conversations. When you're satisfied with the answer or solution you've received, click Close this ticket. If an old issue in a closed ticket resurfaces, you can click Reopen ticket at the bottom of the ticket to reopen the issue with HubSpot Support. When you receive a reply from one of HubSpot's support specialists on an open support ticket, the Help button will turn blue along with a picture of the support specialist and a number that indicates the amount of activity. To navigate to your support inbox to view your ticket and respond to or close the ticket, click Help.